Get the full details on how to build a pergola out of reclaimed barnwood here- From this pergola comment page to the Build a Pergola page Share your comments on our design, or ask any questions you may have about pergolas on this page. 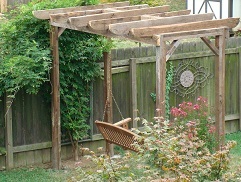 If you have a pergola that you built or purchased tell us how you like it. Do you use it to support a swing, or trailing vines? Share your photos too, and we will post them on this site on a special page just for visitors pergola projects. Give us your opinion on pergolas in general, I WANT TO HEAR FROM YOU! Do you have a great story about pergolas? Share it! Or perhaps you have a question or comment. Express yourself here!